Staff Sgt. David W. Textor, 27, of Roanoke, Va., died Jul 15 in Mosul, Iraq, of injuries suffered from a vehicle incident. 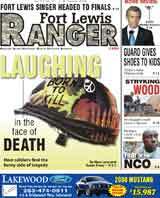 He was assigned to the 3rd Battalion, 1st Special Forces Group (Airborne), Fort Lewis, Wash.